March 18, 2018 - Sgt. Netanel Kahalani, 20, was one of two victims of a ramming attack near Mevo Dotan in Samaria. 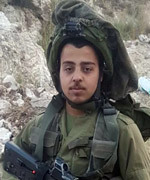 Sergeant Netanel Kahalani, 20, of the northern Israeli community of Elyakim, was one of two soldiers killed in a ramming attack near Mevo Dotan in Samaria on Friday (16 March 2018). Kahalani is survived by his parents, Naomi and Dani, and four brothers. One of his brothers, also a soldier, is currently serving in the Golani Brigade. Posthumously promoted to sergeant, Kahalani was laid to rest at 11:00p.m. on Saturday evening at the cemetery in Eliakim.